Body: WHEELED palomino Thunderbolt. Accessories:reigns, harness, bridle, red whip, and seat. 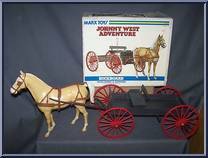 Box: 'Johnny West Adventure'. Buckskin is the only horse with a nodding up and down jointed head! Body: Bay (dark brown) color. 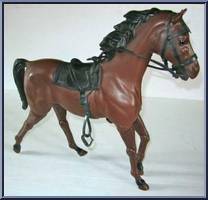 Accessories: Brown or black tack of reins & bridle, saddle & stirrups, blanket, Saddlebags, Ri. 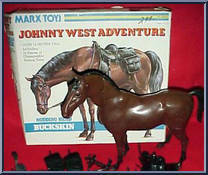 . .
Buckskin is the only horse with a nodding up and down jointed head! Body: Palomino color. 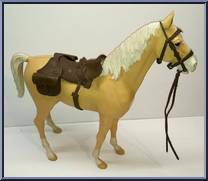 Accessories: Brown or black tack of reins & bridle, saddle & stirrups, blanket, Saddlebags, Rifle scab. . .
Comanche is the only horse with the jointed moveable legs! Body: Bay (dark brown) color. 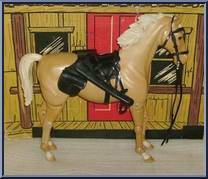 Accessories: Brown or black tack of reins & bridle, saddle & stirrups, blanket, Saddlebags, Rifle scabb. . .
Comanche is the only horse with the jointed moveable legs! Body: Came Palomino color. 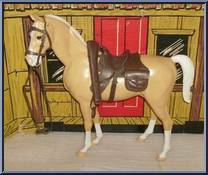 Accessories: Brown or black tack of reins & bridle, saddle & stirrups, blanket, Saddlebags, Rifle scabbard. . . Body: wheeled sorrel (rust) Thunderbolt, with cream mane and tail. Accessories: reigns, harness, bridle, red whip, and seat, cloth cover and supports. 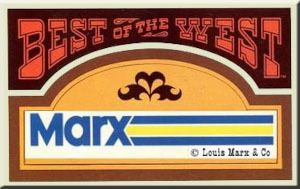 Box: 'Johnny West Adventure'. Body: Pinto horse in dark brown or reddish brown with white spots, and a paint variation of a white knee or dark knee on the right side. Body has a stiff molded stance, used for the indians. Accessori. 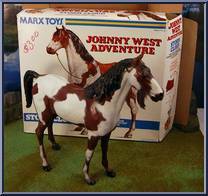 . .
A larger size stiff molded standing horse, the most common horse used for Johnny, and practically everybody. Body: Bay (dark brown) color. Accessories: Brown (most common) or black (rarer) tack of rei. 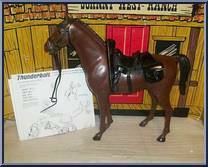 . .
A larger size stiff molded standing horse, the most common horse used for Johnny, and practically everybody. Body: Palomino color. Accessories: Brown (most common) or black (rarer) tack of reins &. . .